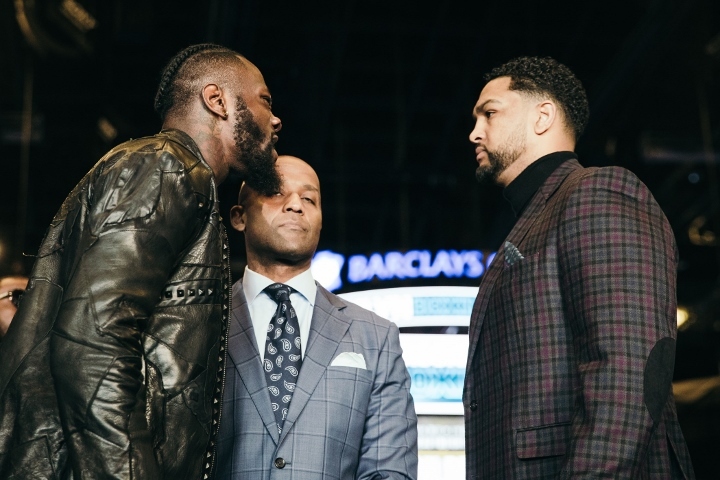 Things are very personal between WBC heavyweight champion Deontay Wilder and mandatory challenger Dominic Breazeale. Wilder will defend his title against Breazeale on May 18th at the Barclays Center in Brooklyn, New York. Back in February of 2017 at a hotel in Brimingham, Alabama, there was an altercation between Wilder and Breazeale, who had knocked out Izuagbe Ugonoh on the undercard of Wilder's defense against Gerald Washington. Breazeale claimed that Wilder and his entourage attacked him in front of his wife at the Westin Birmingham hotel. This came after Breazeale supposedly had a confrontation with Wilder's younger brother, Marsellos, at ringside during Wilder's fight. Things have continued to get personal between the two massive heavyweights. Wilder's team claims Breazeale made a remark pertaining to Wilder's disabled daughter. Both have promised brutal knockouts when they collide in the ring next month. Wilder recently stated that he wouldn't be affected mentally in any way, should Breazeale pass away from injuries related to their fight. "Not one bit of remorse," Wilder said to Daily Mail. "Because this is boxing. This is what we do. This is what we sign up for. "You talk about me killing the guy? If it happens, it happens. When you are dealing with a situation like this and it's personal, I don't mean well for him, nor do he mean well for me. So I speak truth. That's why people love me till this day. Because I speak facts, I speak truth. I'm a realist and I speak how it is. I'm going to handle my business in the ring accordingly, I promise you that. [QUOTE=MDPopescu;19662197]... he ain't, doe...[/QUOTE] Tell that to his fans.